Steak ‘n Shake copycat chili-mac recipe. 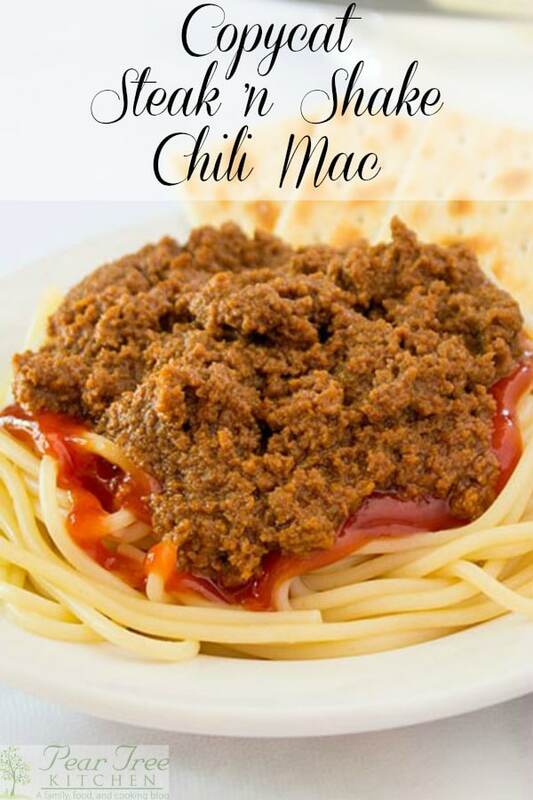 A real chili-mac is not chili sitting onto of noodles or even mixed in with macaroni elbows. Real chili-mac is spicy beef sitting on a dollop of ketchup and a pile of pasta. Chili-mac with beans is called chili 4-way! Chili-Mac has been a part of my life as long as I can remember. Growing up, Wally’s Drive-In was the best place in the world for a hamburger, onion rings, or a chili-mac. I suppose they had other things on the menu, but I wouldn’t know. I never ordered anything besides those 3 things. Wally’s had been a staple in my hometown and it was a sad day when the last carhop delivery was made and the doors were locked permanently. It would be a long time before a genuine chili-mac made an appearance in my life. 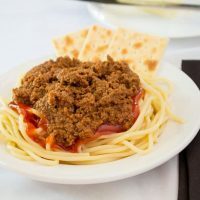 Oh, I’d seen chili-macs on menus and saw recipes for chili-mac, but let’s face it, those were never anything more than chili, with or without beans, glopped on top of spaghetti noodles. If you are from the Midwest you know that a real chili-mac doesn’t even involve real chili. I feel the same way about chili dogs, coney dogs, etc. None will ever be as good as Jaenick’s Root Beer Stand Red Hots and Sauce Buns. Those are not your everyday chili dogs and bear no resemblance to coney dogs at every “coney island” type restaurants that have popped up over the years. But that discussion is left for another day, another post. I encountered my first Steak ‘N Shake a few years after Wally’s closed. It was almost identical to Wally’s. They even had a drive-through. Then we moved…….again. No Steak ‘N Shake in sight or even within an hour’s drive. So, what’s a girl to do? Make your own recipe. The original Wally’s recipe called for kidney suet – um, no thank you! If you are set on having the grease ring at the bottom of the plate that is common when eating Steak ‘n Shake chili-mac, just use a high-fat ratio ground beef like 73/27 and don’t drain off the fat. 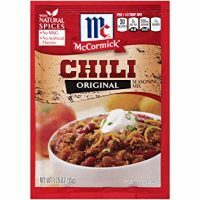 I have never eaten Cincinnati chili or skyline chili, but I suspect Chili Mac might be closer to those than a chili that you eat from a bowl with a spoon. At least in its consistency. I’m not sure about the addition of all those extra spices and chocolate though. Chili-Mac is about as easy as a meal gets. The recipe does not call for browning the meat. That is not a mistake on my part. This recipe continues to simmer long enough that the hamburger is cooked. You could also boil the hamburger for the same smaller pieces, but that just creates extra work in my opinion. That is the secret to getting the proper consistency for my version of chili-mac. REMEMBER TO COME BACK AND RATE THIS RECIPE! Chili-Mac - Spaghetti topped with a Spicy beef mixture. Add cheese for 3 way and Beans for a 4 way. Add ground beef, 1 cup ketchup, chili seasoning, and Worcestershire sauce in a medium saucepan. Bring to a simmer over medium-low heat. Simmer 2 hours. Cook spaghetti near the end of simmering time. Warm extra ketchup in a microwave or a small saucepan. Additional Worcestershire sauce can be added to the ketchup if desired. 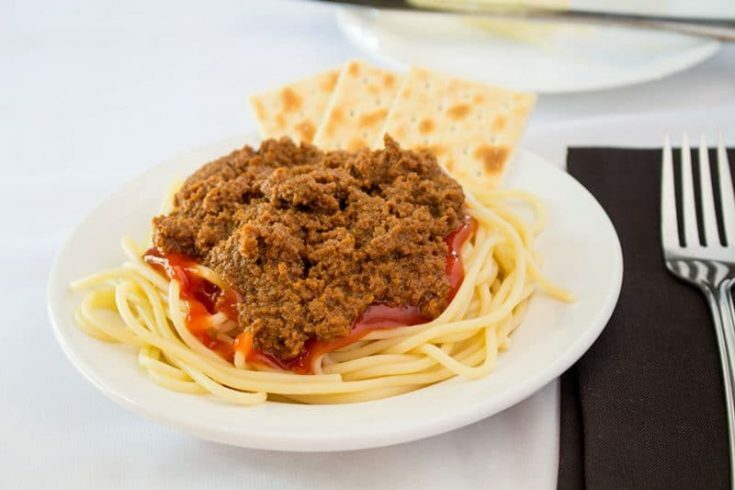 Place spaghetti into a bowl, top with ketchup and beef mixture. Sprinkle any additional toppings you want. Serve with saltine crackers and grated Parmesan cheese. Additional Worcestershire sauce can be added to the topping ketchup for additional spiciness. 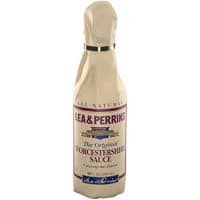 Use about 1 teaspoon Worcestershire sauce for every 1/2 cup ketchup. Nutritional data provided does not include addition toppings or crackers. Data provided uses 80/20 ground beef. It’s my kryptonite too! But I love all things carbs! Oh, Chili Mac. You are my kryptonite. Not that I’m mad about it– especially when it looks this good! Can’t wait to try this recipe!